Well hey there!! 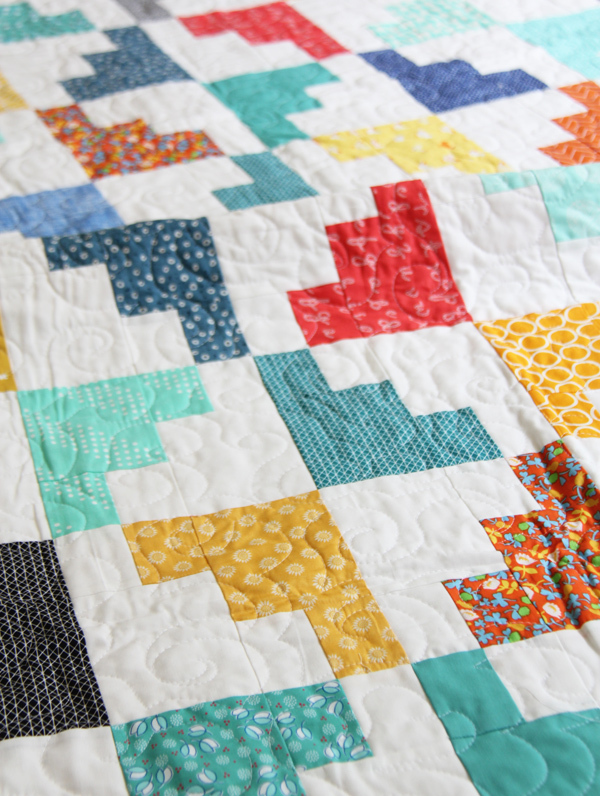 I made this quilt in May….as in 3 months ago…whaaa?? Time sure speeds by fast. I made this one to take to Quilt Market, and I tried to use “gender neutral” colors…but I’m always kinda stumped as to what that means. I figure I would have loved these colors as a young girl… so hopefully someone else will too! This was made with my Hello March pattern (previous post on the pattern here), and a “layer cake” I cut from my own stash. I quilted this one myself and apparently I was in a mood to try something new. It turned out to be a swirly/pointy/popcorn design…in a few places it looks like a hot mess but overall…not so bad! This kid has become an excellent quilt holder-upper. Except he has to stand on a bench and he charges me for his services…$0.25 cents a quilt or ice cream is the going rate for a quilt holder-upper. Not too shabby! 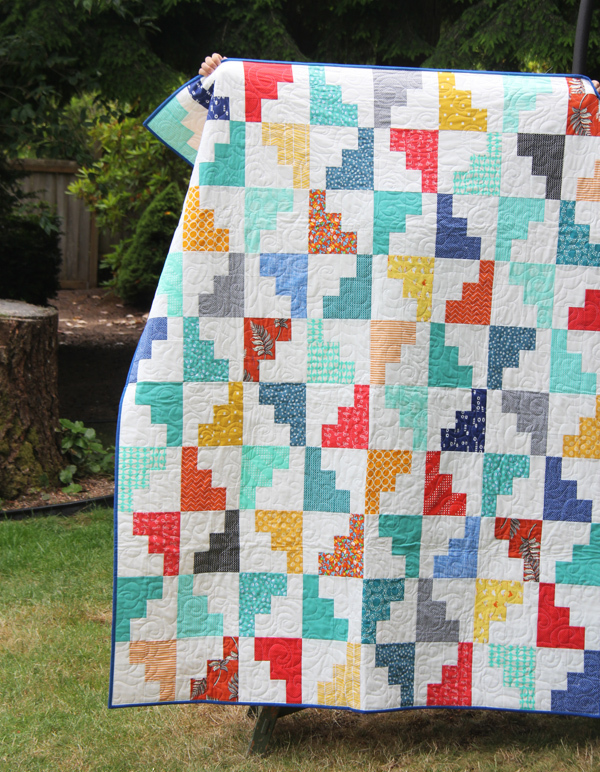 We’ve renamed this quilt “Hello Idaho” in my house since the blocks kinda sorta look like the state. We had a lovely long visit to Idaho last month (Ashton) and even though I love Seattle, I sure wish I could live in both places at once. I have to give a big whopping shout out and thank you to Sarah over at Spunmonkey Designs for helping me me move my website to WordPress last month. It was not without BIG challenges (like me making a big bad mistake and having to re-upload 1500 blog photos!!!!) but it was worth it. If you’re thinking of migrating from Blogger to WordPress, she’s highly recommended by moi! LOVE the quilt! LOVE the fabrics! and LOVE the quilting! beautiful pictures too! Great Quilt! 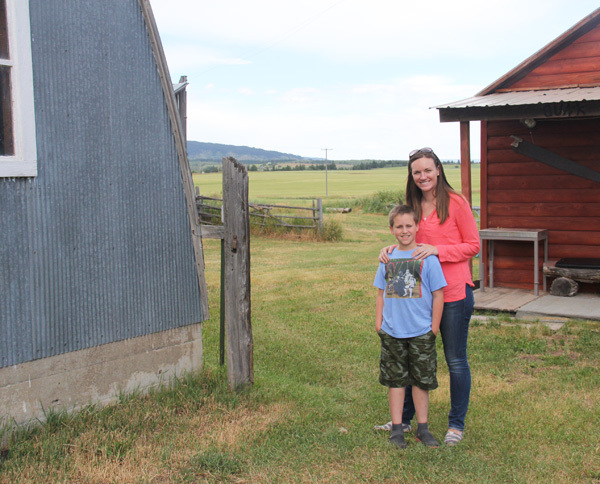 Great Photos, yes it does look like Idaho! Jealous you were in Ashton, I haven’t been there for a bit…if you were in town and went to Big Judds or the church, etc., you probably drove by the house I grew up in! Yes I probably did drive by! My Grandparents live there, Rulon Hillam. :) We ate ice cream at Dave’s every single day. I got ice cream at Dave’s in January! It was Rocky Road. :) Do you remember that I told you that my dad knows your Grandpa!? Do you see Darla Myers when you go there. I adore her, but have only seen her once in 35 years! :)Ricks….mmmm the good ol’ days! Oh that’s right! That was a couple of years ago or more wasn’t it! Nope didn’t see Darla, we spent most the time on the river at at the farm! Good memory Helen!! We lived in Idaho for a bit before we moved to Seattle…and I went to “Ricks” too when it was still Ricks! :) Hope your doing well!! Oh my goodness, your oldest boy is so big now! I realize I have been reading your blog for a long time but didn’t realize for how long until i saw these pictures! What a beautiful family (and quilt!). Missed you but glad you had a summer break! Now I’m headed to buy this pattern wooooot! Looks awesome! Do you remember what the chicken fabric is called and who the manufacturer is? Funny you should mention that Kim because that fabric is from a sleeve of Pajamas designed by heather Ross….a friend sent it to me! I’ve been on the lookout for a print like it though! 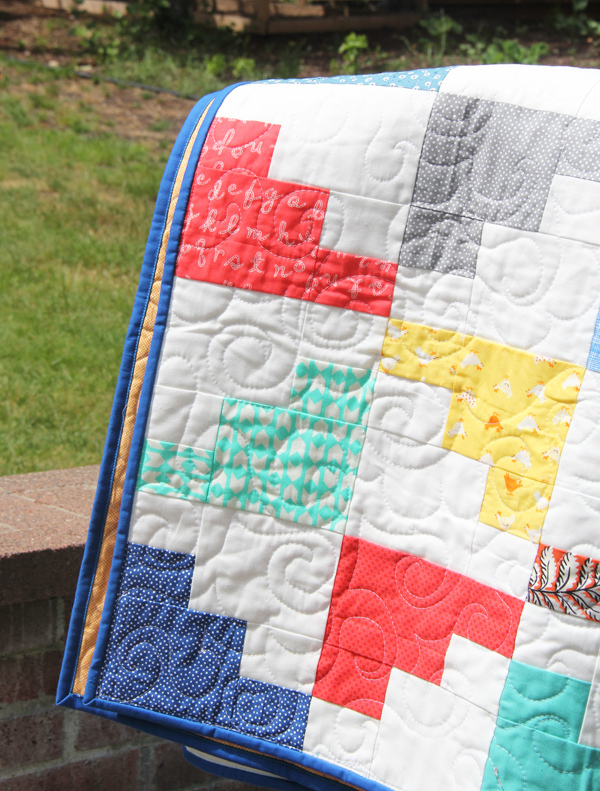 Every time I see one of your quilts I want to run to my sewing room and make one! I love it! best compliment ever Cindy!! :) Thank you! I lived in Idaho Falls for almost 5 years and know Ashton well, been there many times. Love your quilt too, very colorful which I prefer. 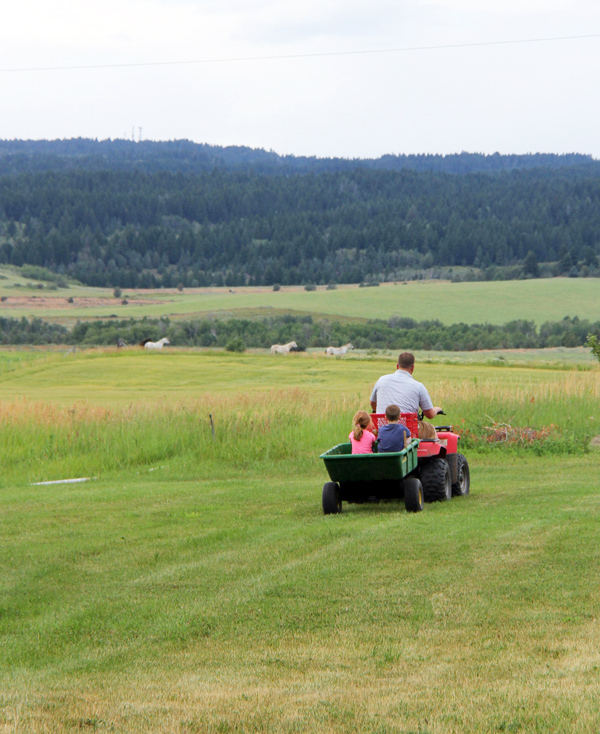 My heart will always be in Idaho, even though we “heart” Montana, too. Your quilt holder-upper is darling – wish I could borrow him to hold my quilts up! 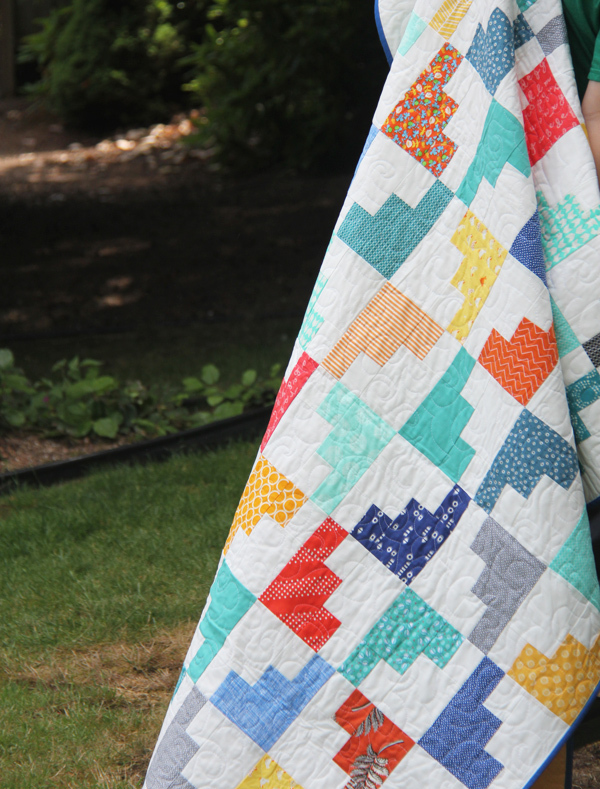 Love this little quilt – now I really want to make one because of the “Idaho” look. 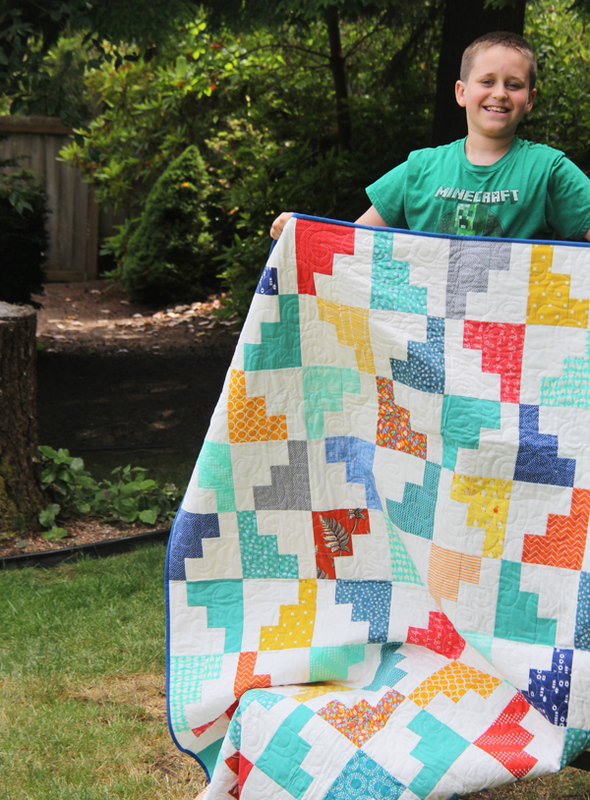 When you wrote this…” I made this quilt in May….as in 3 months ago…whaaa? ?” I stopped and thought, what is she talking about three months ago? Buy yea…wow, that flew by. I love Hello Idaho, the colors are absolutely perfect. And your quilter holder upper, pretty handsome guy there. I meant to say too, I didn’t realize you live in Seattle. I live in Sequim. Just moved here in January…loving it! Washington is a great state! I LOVE Sequim Claudia! We live in Poulsbo…so you’ve probably driven by our house once or twice we live just off the Hood Canal Bridge. Hope your enjoying this beautiful summer we’ve been having!! Great quilt! Your kids are getting so big. Mine are too. Wish they stayed little longer.